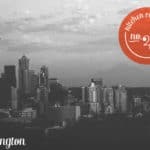 I talk a lot about cocktails on this blog. I love showing you how you can get the most out of your home bar, but there is so much more you can do with your liquors than just make cocktails. 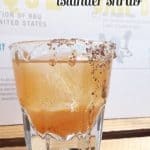 All month long I’ve been sharing bourbon cocktail recipes, but today I wanted to highlight what you can do with it in the kitchen. 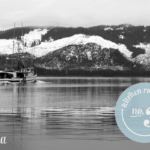 If you missed it, you can see here what I wrote about this month’s Kindred Spirit and how to mix drinks with bourbon. 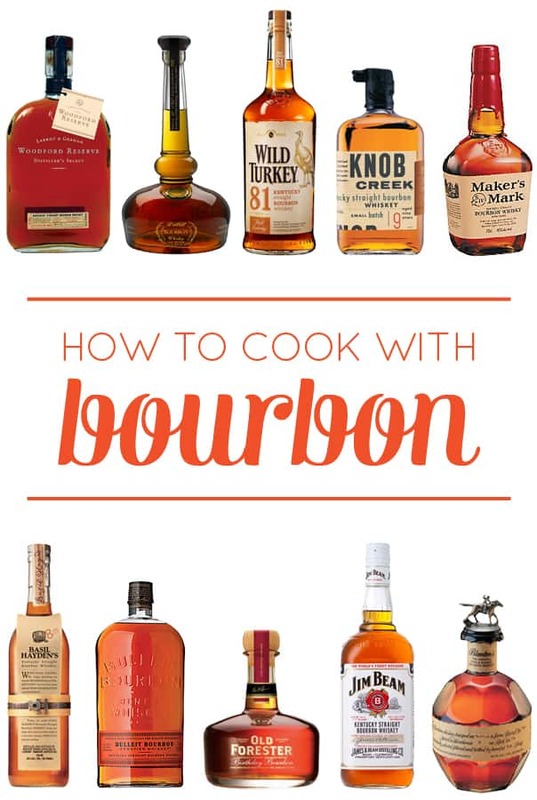 Keep reading to learn how to cook with bourbon. Traditionally, bourbon has been used to flavor confections and desserts (like pumpkin pie! ), but it has a place in savory dishes and sweet sauces as well. Bourbon lends the flavors of caramel, vanilla and a faint taste of wood to your recipes. Freezing it: Alcohol has a lower freezing point than water, which means it might not freeze properly. If you’re making a frozen dessert, an extra kick of bourbon might kill the ice. 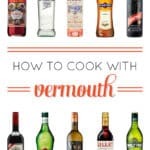 Cooking with it: When you cook with any alcohol, the heat makes the alcohol evaporate. Depending on the cooking method and temperature, the alcohol won’t burn off entirely, but your dish won’t be as potent as drinking straight alcohol. In general, the longer you cook something with alcohol, the more it will evaporate. Bourbon is quite similar to brandy, so you can use bourbon in its place in most recipes. If you don’t want to invest in a big bottle of bourbon for a recipe, you can’t go wrong with the tiny airplane bottles. That’s also a great way to test out any liquor to see if you like it. Savory dishes: Bourbon works beautifully as a marinade or glaze with meats, fish or poultry, or even as a flavor in a sweet sauce. You can also add it to vegetables, like mashed sweet potatoes, or to soup. Sweet dishes: You’ll often see bourbon paired with honey, caramel and vanilla. It goes well in most baked goods, like cakes, pies and cookies. It’s also lovely as a flavor in frosting or whipped cream. Infusions: Flavor your bourbon with vanilla, cinnamon, star anise, cardamom or dried fruits. This will give you your own version of bourbon to bring into your recipes and drinks. 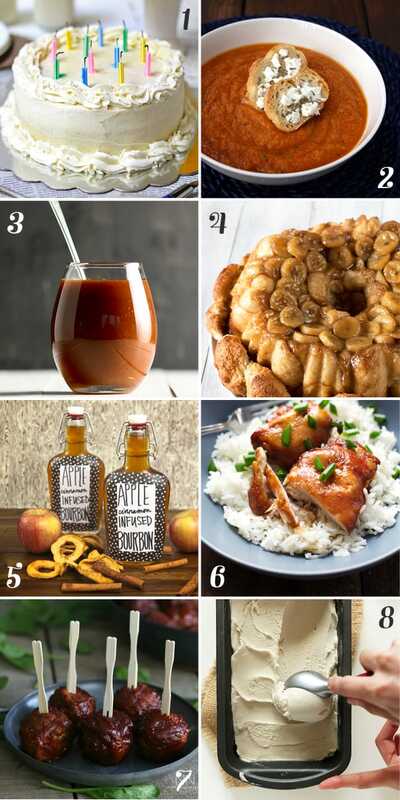 What’s your favorite thing to make with bourbon? Thank you for sharing my recipe BFF! *blushing* P.S. I owe you an email today! I usually add bourbon to something I bake or ice cream, but I’m dying to try sticky bourbon chicken and bourbon BBQ meatballs. Sounds so delicious! You’ve actually got me excited about cooking nightly dinners with this post! Yep, still my hero. That bourbon caramel ice cream!! Be still my heart.